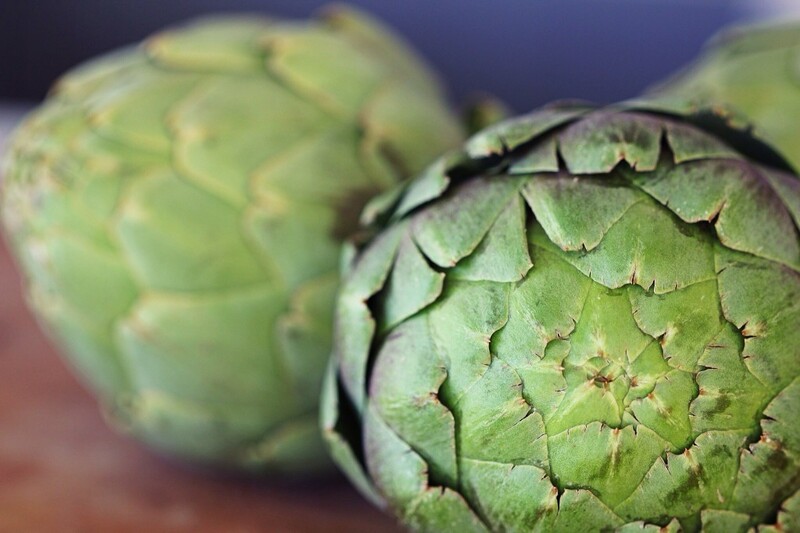 On top of being complexly flavoured, with a sweet and creamy texture, and leaves that were meant for scooping, artichokes are actually very good for you. 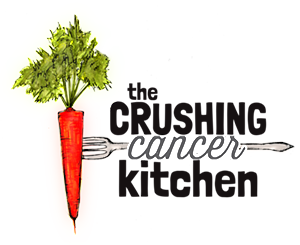 Cancer hates the artichoke (especially the leaves) due to its high levels of antioxidants, fiber and it’s ability to support and protect the liver. 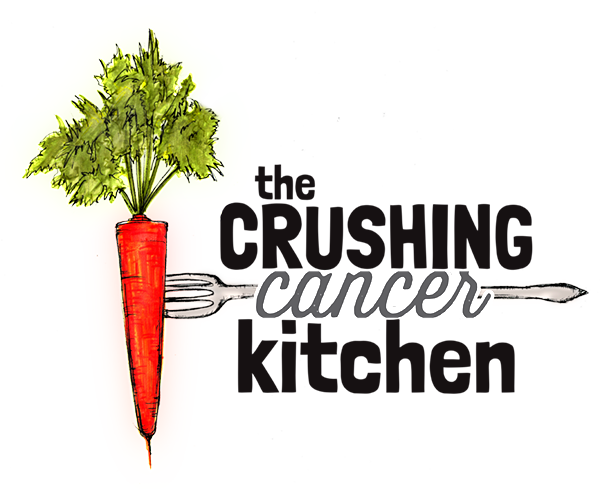 It is also anti-inflammatory, has shown to inhibit cancer-related angiogenesis. What a pleasant surprise. Before you get to the artichokes, get your pot ready. 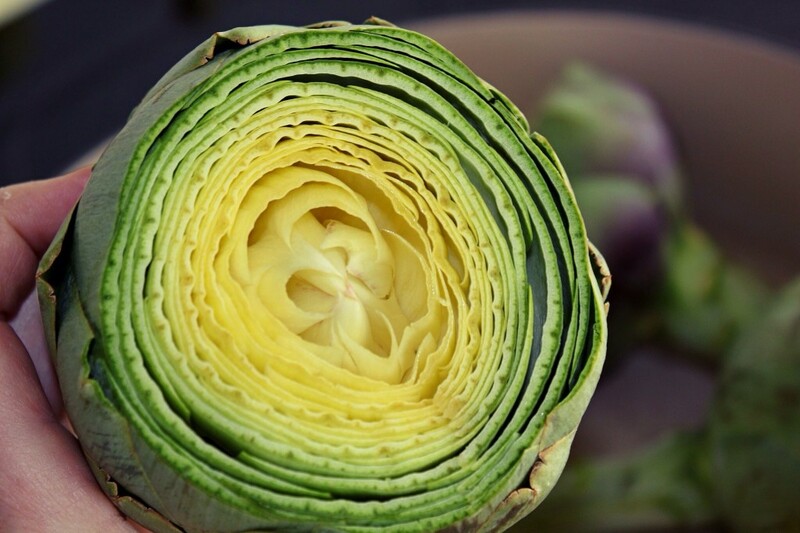 Make sure that your pot has a fitted lid, and that your artichokes will fit in it comfortably with space to move. Fill the bottom of the pot with 1-2 inches of water, a whole lemon, sliced and aromatics (garlic, fresh thyme). Now for the Artichokes. Pull any stray leaves around the stem or stragglers around the heart off. Trim the bottom of the stem off, leaving at least two inches. Many recipes will tell you to take it right off, and although it can be stringy and fibrous, sometimes this is the best part, and definitely worth the gamble. With a very sharp knife (or a large serrated knife) turn the artichoke on its side and slice off the top inch or so of the leaves. This prevents being poked by the spikes and speeds up the cooking a little bit. You can also take scissors and trim the rest of the spikes off, or just be careful while eating them (you don’t actually eat that part). 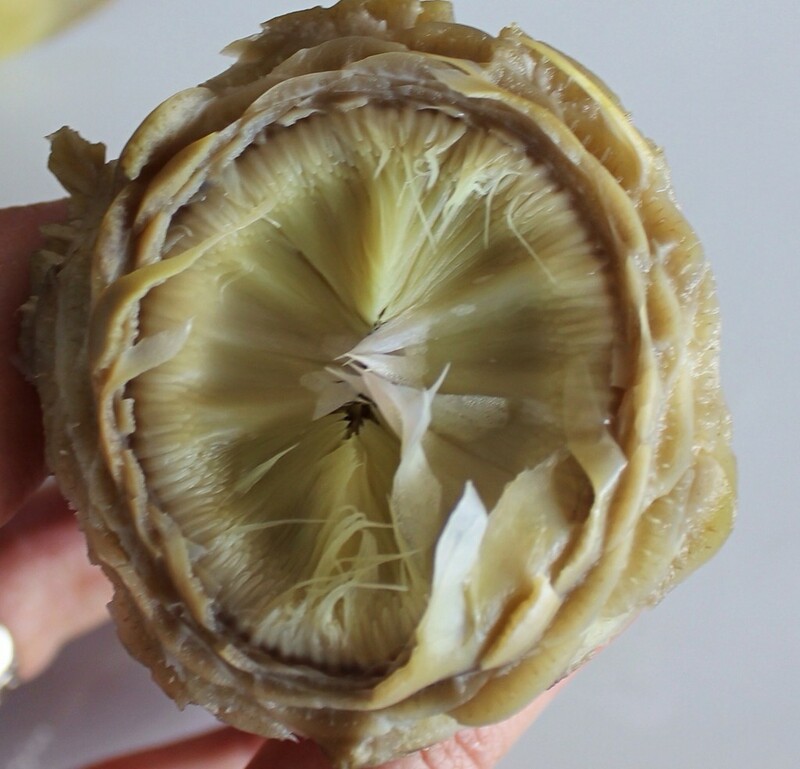 Artichokes oxidize quickly and any raw juices you get on your hands will turn them a little bit brown and make them taste really bitter, so it’s best to work fast. Put them in the pot, ensuring that they are not squished up against each other and put the lid on. 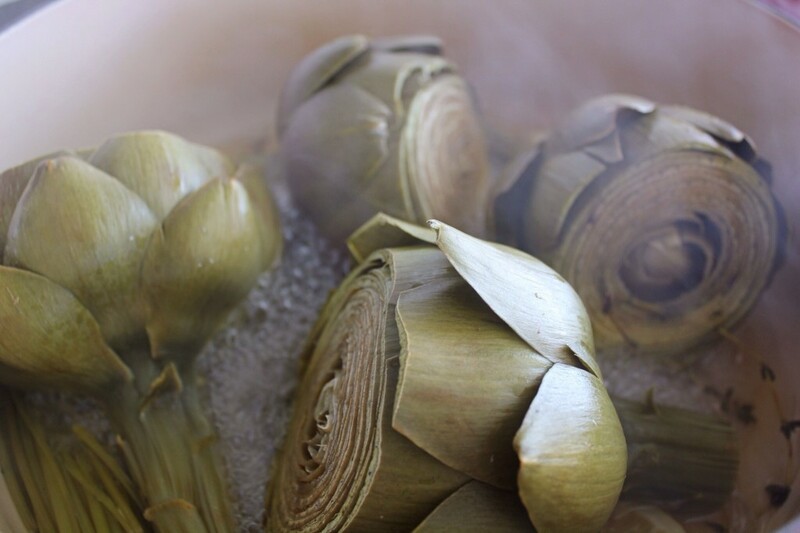 Bring them to a boil, and lower to a simmer for 30-40 minutes, depending on the size of the artichoke. You may want to check on them once in a while to make sure that the water hasn’t boiled away, depending on your pot/stove. You will know they are done when you can pull the leaves off easily, and they are nice and tender (use tongs, taste it). 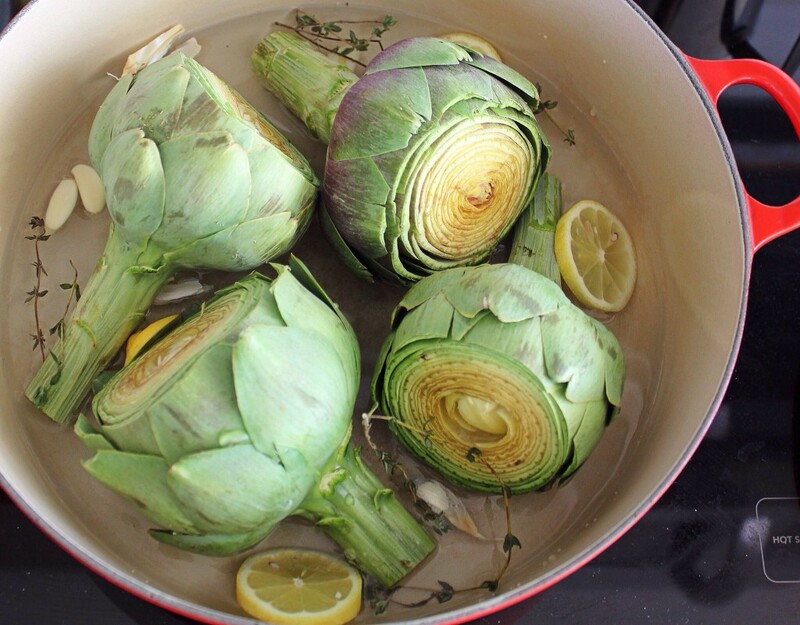 Take the artichokes out and turn them upside down on a plate to drain off the extra water. My sisters and I would dip each leaf into butter with lemon, scrape the good part off with our teeth and throw the rest into a giant bowl in the middle of the table. 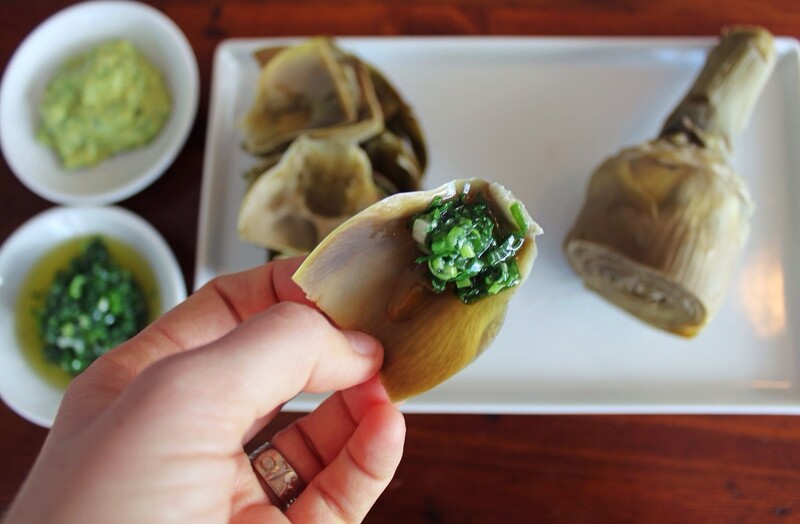 When we got to the bottom, our Mom would help us remove the ‘hair’ or ‘choke’ so that we could eat the best part, the artichoke heart. A spoon makes short work of this part. Or just ask your Mom. I love the artichoke flavour, so I like to keep the dip simple. 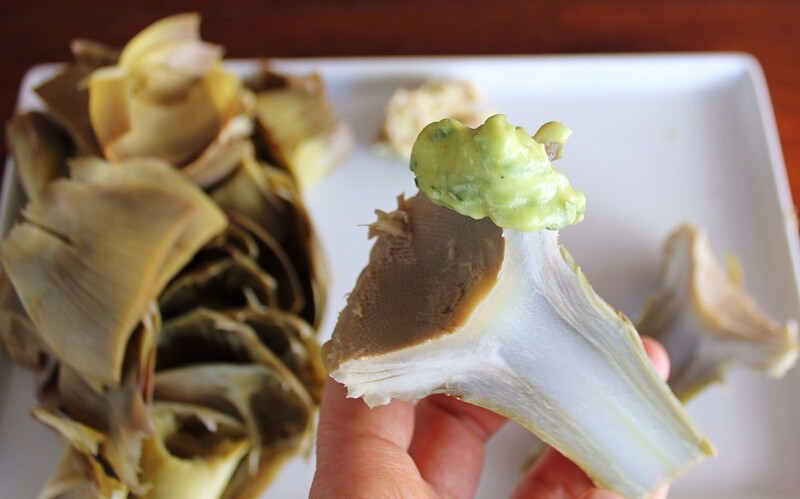 Something with a little fat will help you absorb the most nutrients (artichokes are naturally low in fat) and taste the best. 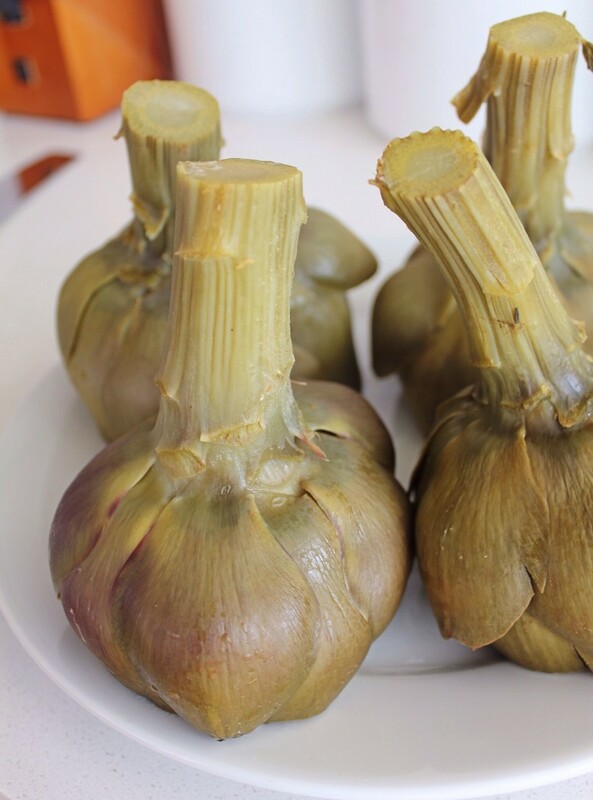 Coconut or extra virgin olive oil warmed with some garlic, lemon and parsley would be nice and simple, served with a warm artichoke. An avocado pureed with lemon juice and zest and a bit of turmeric (to optimize the anti-inflammatory effect), with green onions mixed in would be better for the one you made to have straight of the fridge the next day for lunch. They taste great hot or cold, so make an extra. Your liver will love you for this treat, and the mighty artichoke may just make several menu appearances throughout the Spring.